Make this Cheesy Calzone Recipe to order with turkey, veggie or plain cheese options. Pull this Cheesy Calzone Recipe apart when they're warm and toasty. Open can of dough. (Do not unroll.) Cut dough crosswise in half. Unroll 1 half on baking sheet sprayed with cooking spray; spread with pizza sauce to within 1/2 inch of edges. Sprinkle with mozzarella. Top 1/3 of dough with turkey, then cover second third with broccoli and corn. Leave remaining third topped with just the mozzarella. Unroll remaining dough half over filling; crimp edge with fork. Cut dough crosswise into thirds, then cut each third diagonally in half. (Do not separate dough.) Brush with water; sprinkle with Parmesan. Bake 15 to 19 min. or until golden brown. Cool slightly. 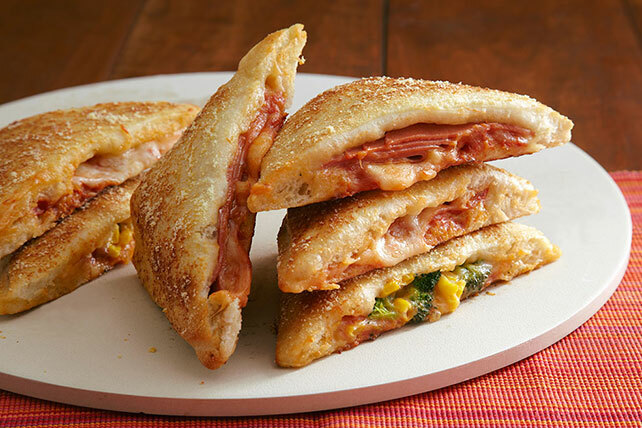 Customize this delicious calzone to meet your family's tastes. Let the kids add their own special toppings before covering with the remaining dough. Prepare as directed, placing 1/4 cup sliced fresh mushrooms and 4 thin green pepper rings evenly over vegetable- and mozzarella-only topped rectangles before covering with remaining dough.